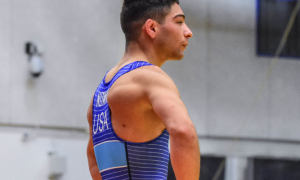 The 2019 Pan American Championships have taken on an increased priority for the United States program to where a full-fledged training camp has already begun in earnest. It all started earlier today at the US Olympic Training Center in Colorado Springs, where a vast collection of top athletes converged to lay down the foundation for what will be a two-week camp focused on preparing the American Pan Am squad, which is comprised of the 2018 World Team members with the exception of Max Nowry (55 kg, Army/WCAP), who takes over the spot in lieu of the (apparently) retired Sam Hazewinkel, and Cheney Haight (82 kg, NYAC), who replaces the also-retired Geordan Speiller. Traditionally, the Pan Am Championships has been a tournament in which the US is expected to perform very well. That does not figure to change in 2019, but the stakes are raised for the event, due primarily to the continued emergence of several South American nations as well as the “Ranking Series” points that are now up for grabs relative to placings. We will have updates from the Pan Ams camp along with an all-new Coach Lindland’s Report later in the week. 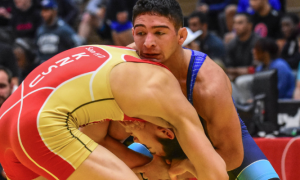 The Greco-Roman portion of the 2019 Pan American Championships kicks off on April 18th and can be viewed live in the US on Trackwrestling. 2012 University bronze medalist Jamel Johnson (67 kg, Marines) has been an incredibly consistent performer not only over the course of his six-year career as a full-timer, but specifically through the past season and a half. 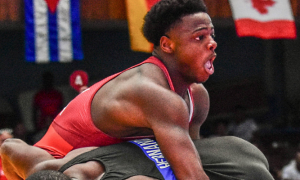 In addition to his various domestic placings, Johnson has added a handful of international medals to his resume, including a silver from Sweden’s Haparanda Cup last December and a gold from the Dave Schultz Memorial in January. As such, he is widely seen as a viable contender for the 67-kilogram throne at the US Open later this month, and right now, he’s in the midst of a serious training block that includes a handful of Egyptian wrestlers. Johnson took a brief time-out on Monday to provide a pulse check on how he’s feeling during what is a busy time of year for the Seniors. 5PM: You have a good relationship with Egypt and their wrestlers at or near your size. What do they offer you on a regular basis that you don’t see from domestic partners or teammates? Jamel Johnson: Really, it’s just feel. Having a foreigner come over is beneficial because their style might not correlate with the American style of wrestling, which is always good to be exposed to different ways people wrestle. Of course, the way they wrestle and the way Americans wrestle is usually different. They like to time it. Don’t rush, just let it develop, don’t rush to get two points and then because you rushed, give up two points. Make sure it’s the good move. Stuff like that. It’s really good to have someone in the room who you’re not used to wrestling on a regular basis. 5PM: You travel a lot. Which do you prefer — going overseas or bringing athletes here you can train with at home? Johnson: I like it better, I guess because I have a family, when they come to us. I’m in my environment, eating the types of food I like to eat, sleeping in my bed, and going home to my wife and kids. So for me being a family man, I like it better when they come here. 5PM: You had Schultz and Armed Forces, and now you have this training block here. By the time the Open arrives, you will have had two months between tournaments. Is that a suitable amount for you? Or, if one more tournament was available, would you have liked to have jumped in that? I know we’re dealing with a hypothetical. Johnson: I would have liked to have had a tournament, yes, but I don’t think it matters due to the way that we train. (Coach Jason) Loukides is very good, when we have these lulls or gaps between competitions, at making sure we still get a little taste of it. For instance, at this training camp, it is tougher than I would say a regular practice is. It’s not necessarily higher in intensity, but there is extreme focus, and that balances out not having a tournament. We still do matches and try to stay in that mindset, paying attention to what you’re doing and actually growing, that way what you are doing is actually getting perfected. Because, that’s why we go to these tournaments, to see where your technique is at, to see where your competitive mindset is. He does a good job of replicating that during practice.